Most herbal tinctures use an alcohol base, often a high-proof grain alcohol. Herbs are soaked in grain alcohol or a mixture of grain alcohol and water for four to eight weeks to transfer the medicinal properties of the herb into the alcohol. The amount of alcohol consumed in a typical dose of an herbal tincture is negligible and safe for most individuals. 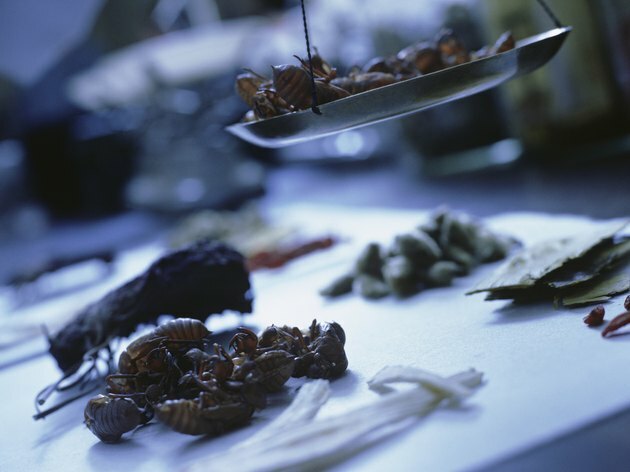 Consult your health care provider before you take herbal medicines. Grain alcohol is a form of ethyl alcohol. Pure grain alcohol or grain neutral spirits are quite high in alcohol -- around 190 proof. While grain alcohol is quite strong, it is safe and sold for consumption. Commercial liquors are diluted substantially. Tinctures produced with grain alcohol are typically diluted with pure distilled water before they are bottled for commercial sale. Tinctures can also be made with vodka, scotch or other high-proof liquors. The dosage of herbal tinctures ranges from just a few drops at a time to two droppers full at a time. The dropper on a tincture bottle holds approximately 30 drops. If you take one dropper at a time, you are consuming less than 1 g of alcohol per dose. A typical cocktail contains 13.7 g of alcohol, according to the Centers for Disease Control. The Centers for Disease Control defines moderate drinking as no more than one drink per day for women or two per day for men. If you consume three droppers of tincture over the course of the day, you have still consumed less than one-quarter of the alcohol in a single drink. A two-dropper dose of tincture contains approximately the same amount of alcohol as consuming a ripe banana. If you take medication that is incompatible with alcohol, avoid alcohol for religious reasons, or would just prefer not to consume it, you can evaporate the alcohol in your tincture. Add the tincture to 1/4 cup of steaming water or tea and allow it to cool, then drink it. You can also find less potent tinctures that rely upon glycerine or apple cider vinegar as an extraction medium.